"I got this recipe from my Italian Grampa, who used to make it for me at Christmas time. Perfect for a choco-holic like me. A guaranteed winner! 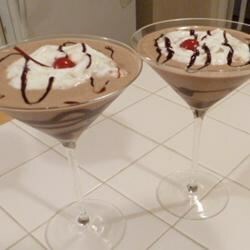 Serve in any glass and garnish with whipped cream and sprinkle on chocolate powder. " In blender, combine brandy, creme de cacao, and chocolate syrup. Blend at medium speed until well-mixed. Add the softened ice cream in large chunks. Blend at high speed until smooth. Serve immediately. OMG what more do you want besides chocolate syrup, ice cream and booze! These were so good DH requested I make another batch. I know we'll make these often, especially during the hot summer! Very yummy and easy to make. I thought the brandy was a little too strong (I'm not s big brandy fan), but my boyfriend thought they were delicious.